As an engineer I love looking at data in graphic format. The numbers tell stories when they form pictures that the mind can absorb. 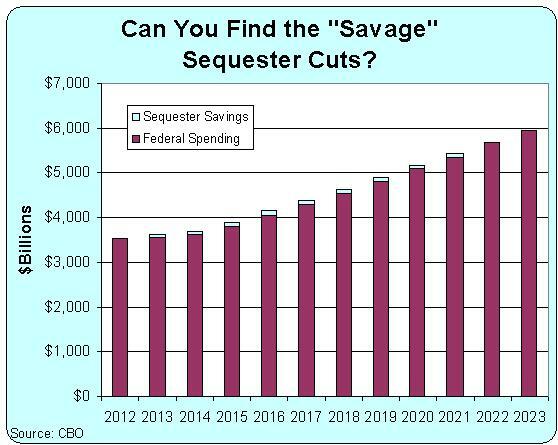 Here is a graph that puts the horrible Sequester cuts in perspective. Thank you Dan Mitchell of International Liberty blog from where I lifted this image. Take the quiz, answer the simple question in the graphic, then ask yourself why are we fussing so much about this issue? Filed under: Conservative, Government | Tagged: Congressional cop out, Game, Learning, Math, Multiple choice, People, Quiz, Safety, Sequester, Trivia |	Comments Off on Take this SImple Quiz.